This months Ladies that UX event was a little earlier in the month than normal so we could celebrate International Women's Day. They had also teamed up with General Assembly and Expose UX to give us yet another inspiring event. 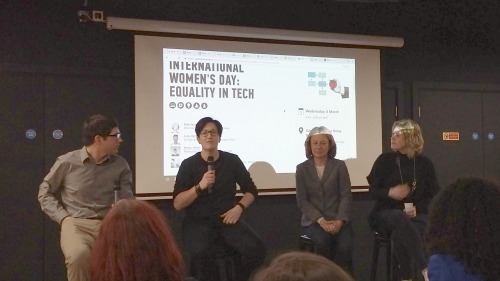 Although the event was called 'Equality in Tech' it really should have been called 'How to be Bold'. Expose UX kicked us off with an example of their new web show 'Fix my App' to show the benefit of UX to business. This film was based round a lady entrepreneur who had set up a wedding vendor business. After the main video they interviewed her asking about what made her want to run her own business. Her answers were echoed throughout the evening. We then had a panel consisting of Sophie Mitchell the founder of LTUX, Julie Kennedy from Capital One and Merje Shaw from The Most Jam Ltd. Sadly Lola Oyelayo had to pull out at the last moment. Sophie started by explaining how she came to start LTUX London, really a response to wanting to meet like minded people and not knowing how. She imagined that she might get ten ladies to attend the first one, but ended up with a waiting list of over 50. Sophie then surprised me by using me as a case study of why she still runs the group and the success stories which have come out of it. As she said it is not just about being bold for yourself but helping others to be bold too. Julie then ran us through her experience from starting 20 years ago as an art worker at the Yellow Pages to being Director of Design at Capital One. As she said, it might sound like a smooth journey now, but at the time it was full of bumps and uncertainty. She said you just have to look for opportunities and take them when they appear. But you also have to be ready to be uncomfortable. Merje spoke last of how she resisted a small start up for ages when head hunted, but eventually ended up working for them. This company was Skype. She comes from Estonia and so had no real idea of what equality was about, under communist rule everyone was equal. Moving to London was eye opening. She ended up starting an agency with her husband. The floor was then opened to questions and this is where all the real take aways came from. Firstly there is never a perfect time to do these things, you just have to take opportunities as they come. I can vouch for that as last year I was planning to move house and then start job searching, however a great job came up before we had even put an offer on and I could not say no. They also said that none of these things felt bold at the time. It is only with hindsight that we see the boldness. Support networks are really important, at home and at work, especially when you are considering something which might have massive consequences for you and your family. If you cannot do something hire people who can. Knowing your limits is an important skill. Speak to people who inspire you. They probably have no idea how cool they seem to you. If you do come across people who want to say your work is theirs, talk over you or put you down, remember that people will know who's work it is, and make sure you always have research to back up your ideas and decisions. Keep calm and always be reasonable. And lastly the only way to get better at public speaking is to practice. This was a great event and so inspiring. It helped me to feel that I have been doing all the right things to succeed while showing me things I can do to improve myself further.